Deacon Dr. Fresh Wine Newsletter: Deacon Dr. McFresh Celebrates Robbie Burns Day! Deacon to Attend Bordeaux Event! Best Wine Before a Lengthy Prison Term! Billy's Best Bottles - Wines for 2006! Anyway, your humble Deacon bein' 1/8th lowland sheep-stealing Scot, I headed out to Allen's at 143 Danforth Avenue for a lunchtime meeting with the ultra-polite, highly-literate and very lurch, Jonathon Kuhling, the salesmeister of Peninsula Ridge Estates Winery. Allen's was Jono's choice, and to be honest with my readers, your humble Deacon of the Grape had passed Allen's on many occasions, but never actually darkened the door. Well I left the Candy Apple Caddy at the curb next to a hydrant with Adam "The Sadist" Sutherland doin' vehicle security duty. Upon entry I was met by both Jono Kuhling and John Maxwell, the highly lurch proprietor of said establishment. John is a very personable and engaging man, and has modelled Allen's on the sort of traditional Irish bar that he grew up with in his native New York. Allen's boasts what is probably the largest collection of whiskies in any North American establishment. How many ya reckon? 12? 63? How about 202? Not even close! This muh-fuh keeps 335 whiskies onhand! In fact his whisky list is bigger than most restaurant's menus! Now since your Deacon's taste runs to grapes alone, Jonathon ordered a Penninsula Ridge 2004 Syrah (or Shiraz to you Australian addicts). It was pretty damn lurch too. I've not been real impressed with the Syrah or Cabernet Sauvignon out of Ontario yet. I've said many times, the only thing that's gonna give it any real punch is to move the earth about 5 million miles closer to the sun. Nevertheless, this Syrah was soft and quite nice; nowhere near the tannic hit you'd get with a French version, but it wasn't green or bland either. 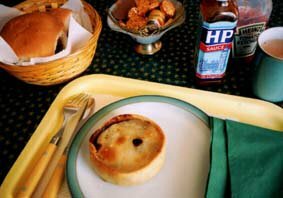 It went great with the Scottish meat pies with HP sauce, and warm salads we ordered. It's hard to believe the winery's only been around since 2000! I'm gonna have to check out their 2001 Cabernet Franc VQA. As you know if you've been readin' regular-like, the Cab Franc grape does spectacularly well in Ontario, and based on this Syrah which needs way more sunny days, the Peninsula Ridge Cab Franc should be amazing! Jono Kuhling and I tied on the feedbags and chowed-down while John Maxwell stood over our table, making sure all was well and then he disappeared for awhile. He was actually gone for about 20 minutes. It turned out he'd gone up to his office and was reading the Deacon's articles online and catchin' up on the latest grape and neck-crankin' news! Jonathon Kuhling is originally from Moose Jaw Saskatchewan and he and I had a fascinating discussion about Peninsula Ridge wine, hypnosis, pain and literature, in the warm, comforting environment of Allen's cozy pub. He put me onto a book, One River, that I gotta read soon. So here's the Deacon's point: If you haven't checked out Peninsula Ridge Estate Wines at your LCBO, or visited Allen's pub on Danforth Avenue, you just gotta do it! Better yet, why not go to Allen's for lunch or dinner and try some of their food with a Pen Ridge Wine and a couple dozen glasses of John Maxwell's whisky? Tell them the Deacon sent you and you'll be treated real well! Thanks John and Jonathon, it was a lurch lunch.